Klmin - (Moon) - A plywood replica of a Chinook canoe. 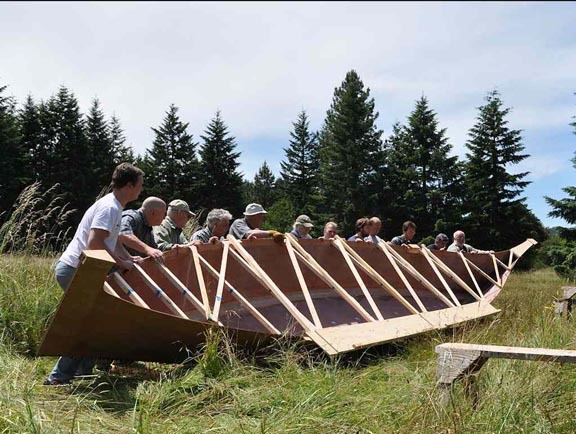 Klmin is a 37 ft plywood replica of a Chinook canoe. The design is based on measurements of a Chinook canoe carved by a member of the Scarboro family in 1905. I have been told that this was about the largest size canoe that was used out on the open ocean. Apparently, larger canoes could get into trouble if they bridged over two wave crests. Canoes larger than Klmin were usually used in the fiords and channels of Puget Sound and British Columbia where the waves are smaller. The "L" in the name Klmin is the "barred L" of the Chinook launguage. It is a soft "L" and is hard to approximate in English. An alternate approximate pronunciation is "Klthmin". He was given to the Chinook nation by Lotsie Holton, a descendant of William Clark, in reparation for the Chinook canoe that the Lewis and Clark expedition burned in 1805. There had apparently been a disagreement between the Chinook and the expedition about the ownership of six elk carcasses. 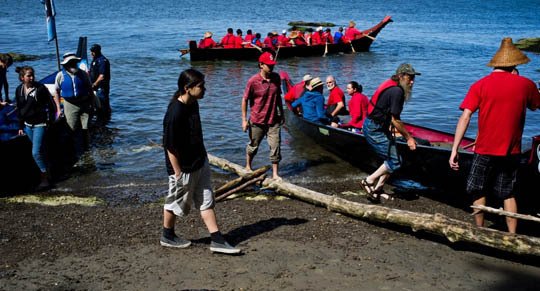 The members of the expedition burned a canoe as a way to get even. 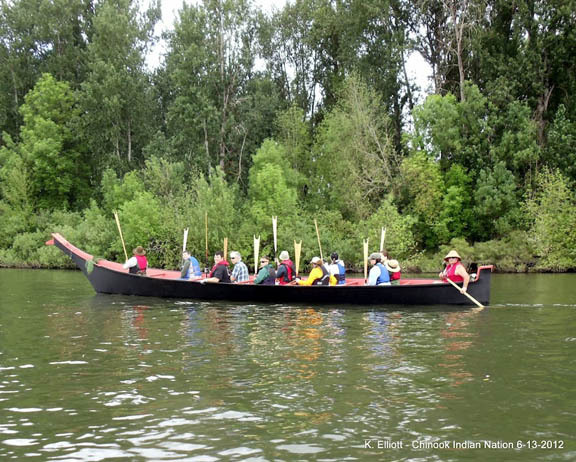 The canoe was given to the tribe at a ceremony in September 2011 at Ft Columbia WA. This site is at the foot of Scarboro Hill right near the beach where the original 1905 Scarboro canoe was carved. The gifting ceremony was the culmination of cooperation between Rick and Lotsie Holton and Chinook Tribal Council Chairman Ray Gardner and the Chinook tribal council. Ray Gardner's wife Jill actually got the whole process started as a result of a chance meeting with Lotsie Holton in Washington D.C. The name Klmin means "Moon" in the Chinook language. Klmin was a Chinook leader who died, leaving no descendants, around same time as the Lewis and Clark expedition. Klmin may have died in one of the plagues that the Europeans brought. In the Chinook culture a person who passes is not mentioned by name for a year. In this case the situation was so distressing that the word "Klmin" was banned from the language. Since then the Chinook People have used the English word "Moon" instead. Now the name has been revived to be given to this canoe. We were privileged to be asked to make this historical canoe. George Lagergren, a Chinook elder who was the last of the traditional canoe carvers, donated the cedar from his land to be used to carve the heart, nose and tail of this canoe. Jim Cedarstrom of the Kalapuya Tribe donated countless hours in making this canoe. He helped me to raise the bar in accuracy on this project. Tony Johnson of the Chinook Canoe Family did the finish carving of the nose and tail. Klmin went on his first journey this year, the Paddle to Squaxin Island 2012. Departing from the Long House at Ridgefield WA, Tribal Council Chairman Ray Gardner is the helmsman at the stern. Rolling the hull at our boatshop.